Is This a Sign to Sell Google Stock Today? As one storied stock picker sours on the search giant, should you also consider dumping your Google stock today? 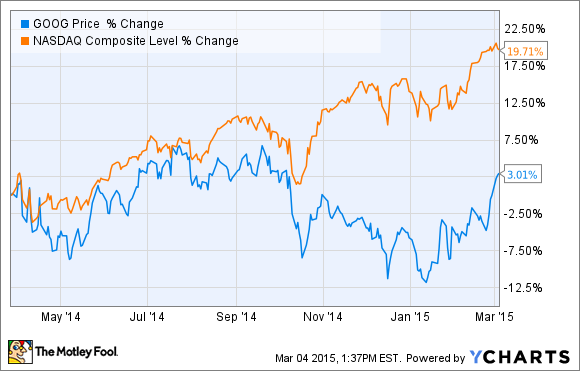 Has tech giant Google (NASDAQ:GOOG) (NASDAQ:GOOGL) lost its groove for investors? It's not an unfair question. After obliterating the market's return during the 2000s, Google stock has actually underperformed its benchmark index The Nasdaq Composite since the turn of this decade, albeit by not much. Although clearly difficult to parse what's behind the multi-year lag, one of Google's largest investors appears to be voting with its wallet by selling Google's shares en masse of late. So just how big of a deal is this? More importantly, could this investor be right? Are Google's best days behind it? Let's take a look. In a recent annual filing, mutual fund giant Fidelity disclosed that its top-performing Contrafund mutual fund had cut its holdings of Google by one-third during the past few months. This might not sound like a big deal on the surface, but it's the "who" and "why" behind this move that makes it a more significant dissenting vote than it first might appear. Weighing in at $107 billion of total assets, Fidelity's Contrafund chalks in as one the largest mutual funds in the world, and certainly one of the largest stock mutual funds. However, despite that size, the Contrafund has been an exceptional performer, outperforming the S&P 500 by an annual average of 2% during the past decade according to Morningstar. Thanks to this outstanding track record in an industry where structural challenges make consistently outperforming difficult at best, the Contrafund's manager, Will Danoff, is seen as one of the more well-respected managers in the industry. Coming from this manager and this fund, the decision to sell Google shares clearly falls well short of encouraging. However, it's the "why" of this story that's even more concerning than the "who." In the annual filing, Danoff explained his rationale in dumping Google shares, saying, "The firm [Google] continued to do phenomenally innovative things, but it is fighting a shift away from desktop search to less-expensive searches on mobile phones." It's hard to summarize the current state of affairs at Google any more concisely than this. Google is the most dominant online advertising company in the world. However, Google's Android mobile operating system has proven both a blessing and a curse for Google. Android and the on-going proliferation of mobile devices, in general, have led to an absolute explosion in Google's overall search volume. Sounds positive enough, right? However, things grow worrisome when you note these mobile searches are vastly less profitable than Google's desktop searches. Moreover, this trend shows no sign of abating as mobile phones and their utilization, especially in emerging markets, are set to continue their strong growth in the years ahead. Worse yet, Google has thus far shown no ability to reverse or offset this trend. So far, this trend hasn't had a hugely erosive effect on Google's margins. However, given the current growth outlook, it doesn't take an overly active imagination to envision how this could drive lower profit margins at Google and prove a drag on Google's future stock price appreciation. To be candid, I see both sides of the argument here. I'm torn. On one hand, you have Google, one of the most innovative companies in the world today. Although some of its activities, like self-driving cars and Internet-beaming blimps, might seem farfetched, it's important to realize that many of these "moonshots" would have massive business implications for Google's growth trajectory should they fully materialize. And for a company that generated more than $22 billion in operating cash flow in FY 2014, these kinds of potentially transformational bets are probably worth making, provided they don't get too out of hand. I also believe the slow bleed of Google's advertising rates is a genuine problem at the search giant for all the reasons I enumerated above. We Fools certainly believe in harnessing the transformational power of great companies to help meet our long-term savings goals. We also understand that even the best companies in the world encounter the occasional rough patch, and that it's often more financially productive to buy and hold during the long term than sell in a panic. Rather than take a hard stance -- because I don't necessarily have one -- I implore Google investors old and new to strongly weigh both sides of the complex situation before either investing in, or divesting from, Google stock today.